Happy March and National Nutrition Month! This month the podcast will bring conversations about nutrition and body image. Bernie is back this week and we have two guests on the show! 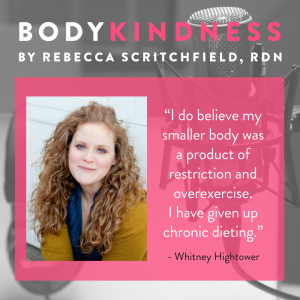 You’ll hear fellow dietitian Whitney Hightower talk about what it was like to be complimented for dieting because it made her body smaller and criticized for gaining weight when she stopped dieting. Then our very own podcast producer Shauna Reid comes on as we discuss the perils of being on Weight Watchers numerous times and what it means to offer a program to kids. Whitney Hightower, MS, RDN, LD is the Dietetic Internship Assistant Director/Field Supervisor at Keene State College. She’s a Registered Dietitian with seven years diversified leadership experience in community nutrition program development and evaluation, counseling, undergraduate and graduate-level research and instruction. You can find her on LinkedIn. 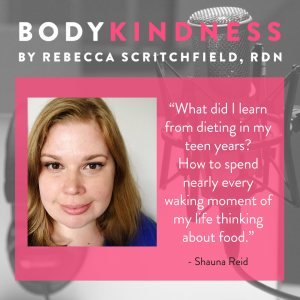 As well as working on the Body Kindness podcast, Shauna Reid is a freelancer writer and the author of The Amazing Adventures of Dietgirl. She writes about her life, travels and wellness journey, most recently ‘Things I learned from 11 trips to Weight Watchers’. Find her on Twitter and Instagram.